It’s about money. This week 22 US Senators wrote the President asking him to pull out of the agreement. Implementing the agreement, the letter said, would create “burdensome regulations” that would hinder oil, gas, and coal exploration, and keep Trump from rescinding the Clean Power Plan. And who were these 22 Senators? 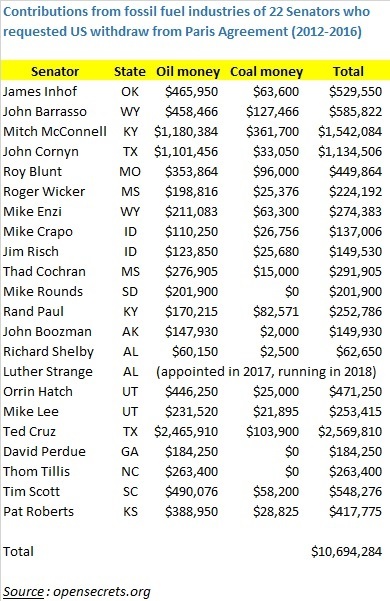 Big recipients of contributions from the oil and coal industries, that’s who. 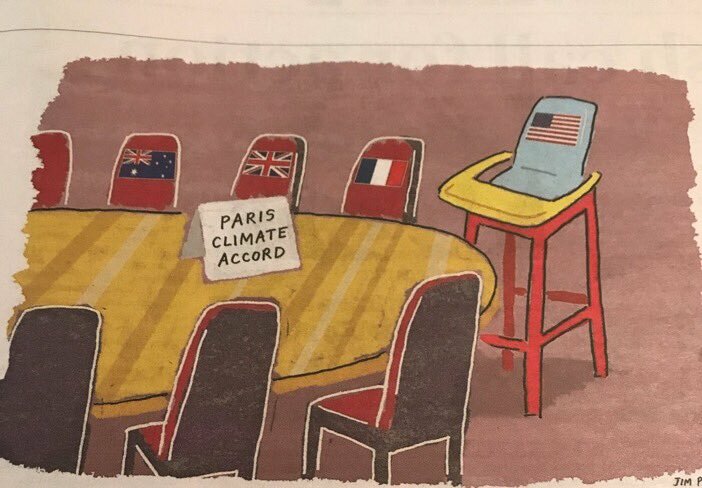 Pulling out of Paris is a way for politicians who have been bought by fossil fuel industries to protect their sugar daddies. The chart below was created from data at opensecrets.org, totalling donations from the 22 signatories in the 2012, 2014, and 2016 election cycles. You have to wonder what these men will tell their grandchildren about the ultimate cost of choosing money over the environment. You can tell them what you think at the ballot box in 2018 and beyond. This entry was posted in Climate change and tagged campaign contributions, climate change, Paris climate agreement. Bookmark the permalink. As always…follow the money. Hope all the folks who voted for him are well connected to corporate America. That is the segment of America who he will make “great.” Well said, David. the planet is getting even warmer with all of the hot air coming from the White House. so much for “draining the swamp.” Thanks for your steady perspective.